Bouchon is a lovely French bistro - just as its name implies. In order to maximize your appreciation of your dining experience here, take note of a few things, including where to sit, what the atmosphere is like and whether you need reservations. For all this information and more, please read on. Reservations are strongly recommended for dinner, although at breakfast tables are offered on a first come, first served basis. Seating is comfortable; the tables are close, but there are long walkways between them that run the length of the restaurant. 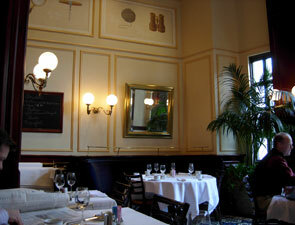 The banquette seating is in typical bistro fashion; you can slip through to your seat, but not much else can join you. Music is playing in the bistro, which is quite a lively, fun place to dine. The feeling is very upbeat. The restrooms are easily accessible, although one should note that they are located outside of the restaurant, a few feet from the front entry. Gratis valet parking is available at the hotel. Best Breakfast in Las Vegas, Las Vegas Life magazine; Best French Restaurant, Las Vegas Life 2005 Epicurean Awards; Best Strip Restaurant, Las Vegas Life 2005 Epicurean Awards; Best New Restaurant, Las Vegas Life 2005 Epicurean Awards; Best Restaurant Overall, Las Vegas Life 2005 Epicurean Awards.